Rob built a wall in the shop to divide it. 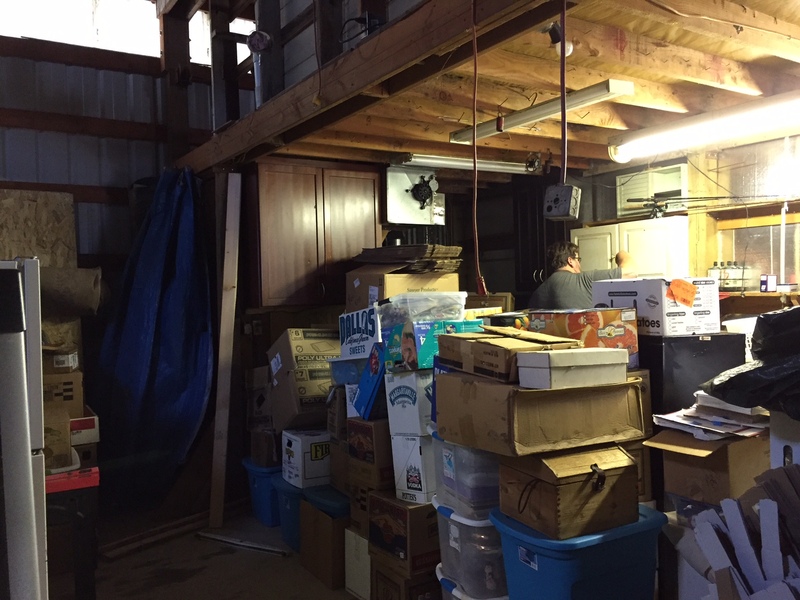 There was a tarp there when we moved in, but he wanted a wall so our freezers and canning could be placed along it. 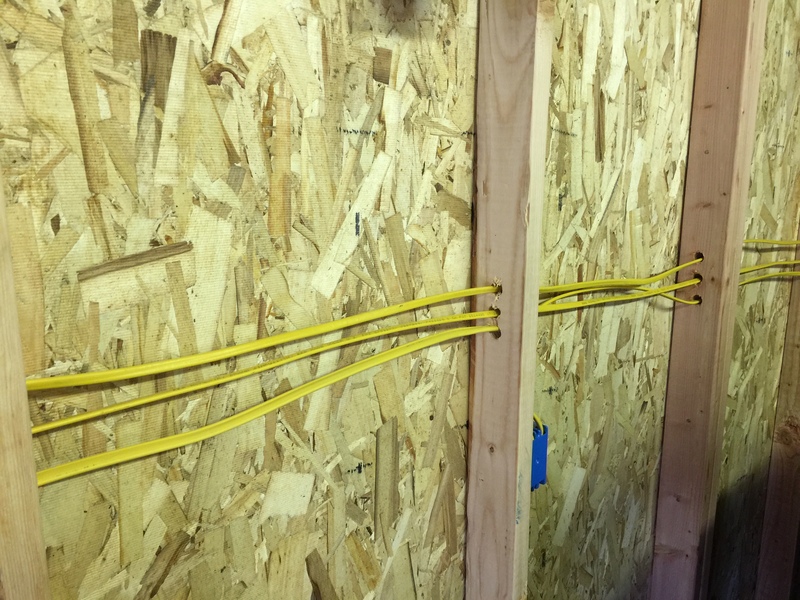 He had our electrician friend wire it so it could handle all of the freezers and our extra fridge. It passed inspection on the first try! Although we have spent plenty getting this house in order, everything he can do himself saves us a lot. He bought some of the wood, but was able to get some for free from a scrap pile a company was discarding for some of his projects. We were given a few groceries. There was some tuna in the bag. I made tuna noodle casserole. 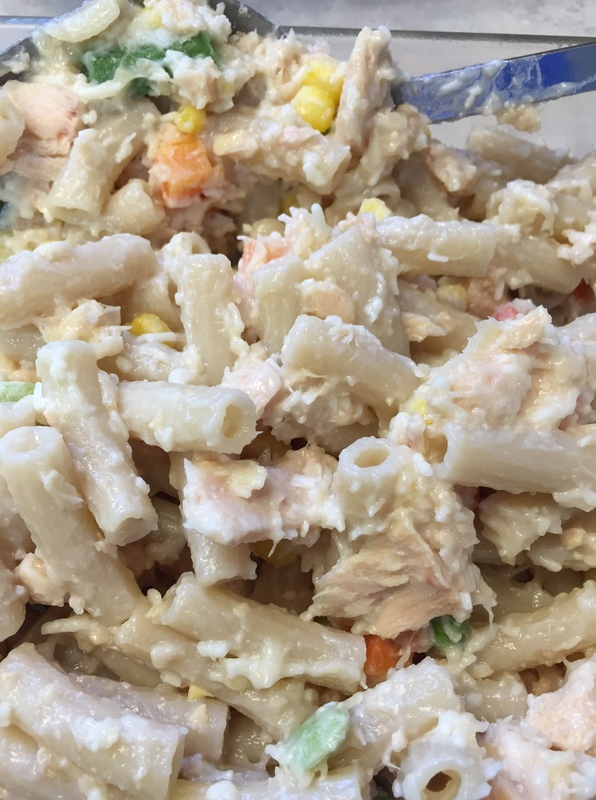 I used gluten-free penne pasta I had on hand, some frozen mixed veggies, gluten-free cream of chicken soup, cheese, tuna, and dried onion. Very basic, but it was yummy! There were a few potato chips in a bag and I crushed them for the top. I was also able to purchase a 5-lb bag of white cheddar cheese for less than $7 at Cash and Carry one day. I put it in the casserole, froze some, and have been using it right and left. Also, Fred Meyers has Tillamook cheese for $5 for a 2 lb loaf, an incredible price, so we got some of those. 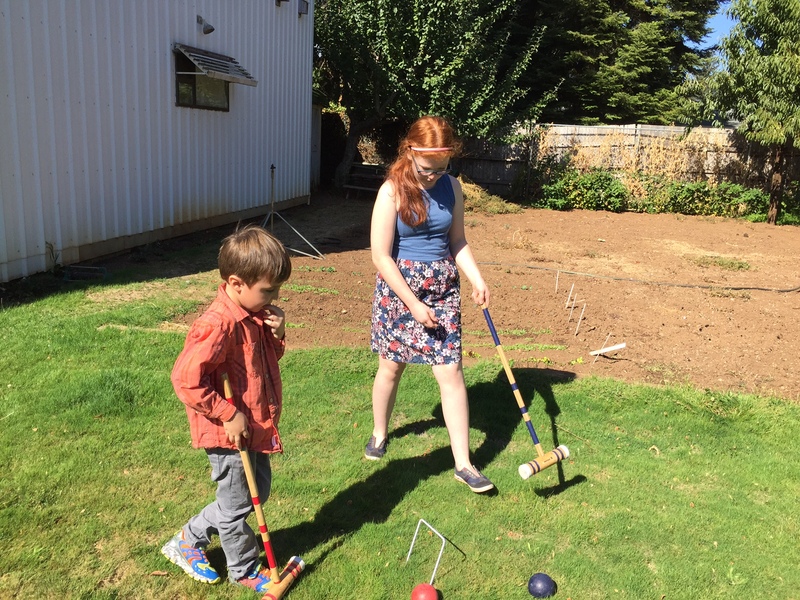 Patsy and cousin Jake enjoyed a game of croquet in the backyard on Sunday. It was great that we found the set and they could play it! The fall garden is growing. I love the leaf in the picture, it reminds me that even though it is very warm right now, fall is on the way! 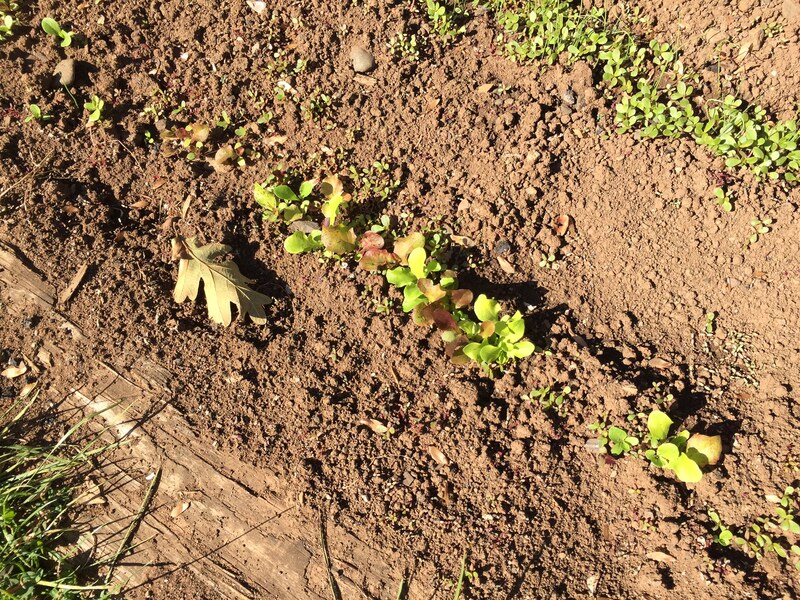 I have high hopes that this lettuce will give me salad before frost comes, though. Happy to see you are settling in. You inspire me. Our garden is finishing up. One of my favorite meals is to steam onions, zucchini and tomatoes in a little chicken broth then drop in some homemade fettacini and finish with some sesame oil. We have chickens so the entire meal only requires purchasing a bit of flour and the sesame oil. Cheap filling and yummy! Our apple trees are loaded so I am busy making apple goodies and freezing applesauce. The peelings go to the chickens or to make apple cider vinegar. A chicken in the pressure cooker yields many cups of chicken broth for meals and freezer as well as cooked chicken for several recipes. Chicken salad stuffed into tomato cups is another fall favorite….isn’t fall in the northwest the best. I’m in Idaho now but was in Astoria 15 years. I can still close my eyes and smell the ocean. God bless! I’ve never made homemade noodles, but they sound great. I do love making my own broth. I’m looking forward to having my freezers down at this house (soon), and getting to use up the last few home-grown chickens. We won’t be able to raise chickens here, but will love finishing up the ones we did. I am so happy that you are all moved into your new home and can finally breath a sigh of relief again. I do hope your garden will give you lots of yummy things to eat before the frost hits. We came close here last night and I am thinking I need to get all the tomatoes picked before we head out on vacation on Sunday. That sounds like a great idea! Then you can relax on your vacation. I’m hoping for quite a few more weeks before frost around here! Hey that bundle in the garage is nothing compared to what you’ve been through. You’ll be finished before you know it and that new wall is going to be great for the freezer/ice box collection you’ve got. I think I remember you got rid of some so how many does that leave you to fill? I still have 2 upright freezers and 1 chest freezer. I used to have 6 total. We won’t need as many because we aren’t going to raise our own meat anymore. However, we still plan to buy beef in bulk and also will freeze many veggies and fruits. I will also continue to buy several chickens or whatever when on sale. I also have an extra fridge that I will put out there to use for extra produce, drinks, etc. and for holidays and gatherings. So proud you are in your new home.. And things will get all settled and all the things will find a place .smile. the dish looks fantastic. I love cheese , of all kinds.. You found some great deals. May God bless you and your family. Have a great week. Thank you, Judy. I got a few more boxes undone yesterday, but am using most of my time doing school with Ja’Ana these days, as well as working (I got a part-time job). So, I’m just unpacking a few each day as I can, and, yes, it’s really coming along. Thanks, Teresa. That does sound easy, and it’s good to know I could do it gluten-free. I might see if Rob and Ja’Ana (the mighty thrift store hunters) can find a pasta machine for cheap sometime so I can try it. We are going to hold off on chickens for a while until we get our new lives figured out:) So much left to do!! But, then, we may see what we can find out about regulations, etc.